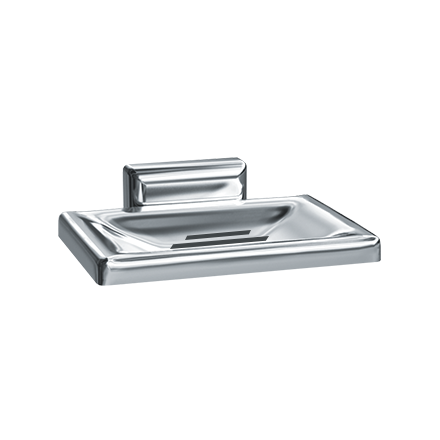 Fabricated from triple chrome plated rust-resistant Zamac and specifically designed with slats for a drain. One stainless steel slotted headless set screw is provided along perimeter of flange for anchoring to stainless steel wall bracket. Wall anchor also provided. Wall bracket is surface mounted using two # 8 pan head screws (supplied) through holes provided. Soap dish is mounted over top leg of bracket and secured by set screw from underside.